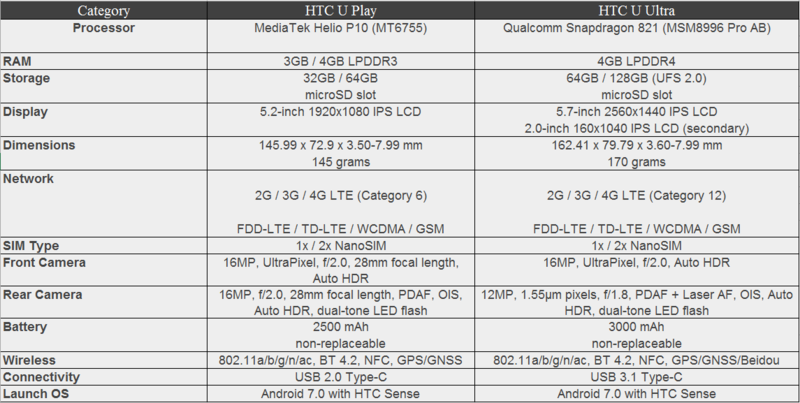 HTC introduced two new smartphones to its lineup recently,the HTC U Play and HTC U Ultra. These phones are designed to perfection with hits aluminium unibody and curved glass back. The concept of having a glass back been trending lately with HTC introducing its “liquid surface” that reflects the lights in a visually impressive manner. To impress further, these phones come in four different colors which are Black, Pink, White and Blue. Featuring a stunning 3D-contoured liquid surface and an all-new Dual Display and voice recognition system, the HTC U Ultra is meant to be both a reflection of the unique personality of each user, while also being smarter and more responsive to bring out the best in U. Designed with a symmetric build and made to be exquisitely thin, the HTC U Play is the playful phone that is meant to fit perfectly in your hand and carried wherever life takes you. The phone is the perfect companion that constantly listens to you, learns from you and is ready to capture the best of U. We are not sure about the availability in Malaysia, however we are expecting it come pretty soon over here as the competition is pretty tight and HTC definitely needs to show its true potential. Previous ArticlePlace your pre-order now for the Samsung Galaxy A5 and A7 2017 and get Level U Pro worth RM399! Next ArticleTop gadgets from Lenovo to usher in the Lunar New Year!